Do you know what a musk ox is? They are related to sheep, goats, cows, and buffalo. They chew their cud like their relatives. They have a big horn that runs along the front and down the sides of their head for protection, long fur to keep warm, and hooves to dig in the snow for food. 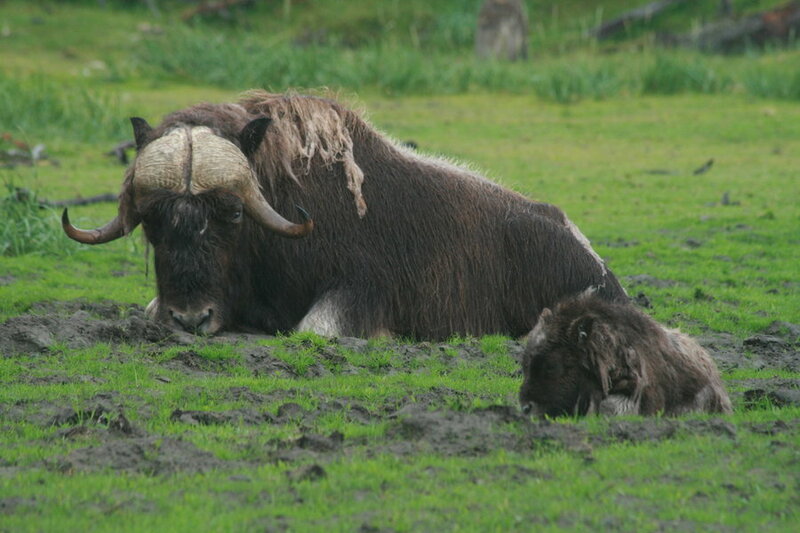 Musk oxen eat grass, plants, moss and lichen. Musk oxen live in arctic or cold places which are very far north. Felix is a musk ox living with his family and other musk oxen in the Canadian Arctic. He was so cute when he was born. His father, Hubert, meaning "bright mind and intelligent," named him Felix which means "happy, lucky, and fortunate." Felix’s mother, Idette, meaning "work," loved the name and hoped he would grow up happy and fortunate. Felix was happy in his early life. He was an obedient calf. He didn’t argue, and he wanted to please his parents. He respected them for who they were and what they said. They told him of the dangers and taught him what was good to eat and what could hurt him. They retold stories of courageous musk oxen and times of famine and plenty. He loved to hear the stories. He was proud to be one of the stout musk oxen. 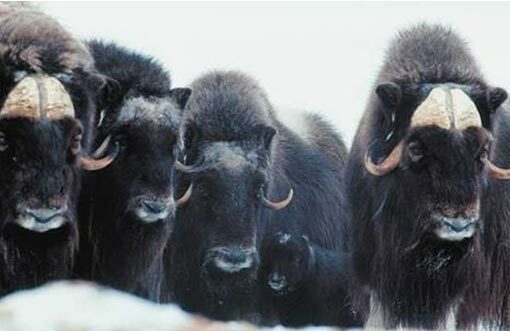 Musk oxen live together in groups for one particular reason. Do you know what that reason is? They do it for protection. Arctic wolves and arctic foxes prey on the young, old, sick, and weak. They also huddle together for warmth against the arctic blast of wind. It is very cold where they live. 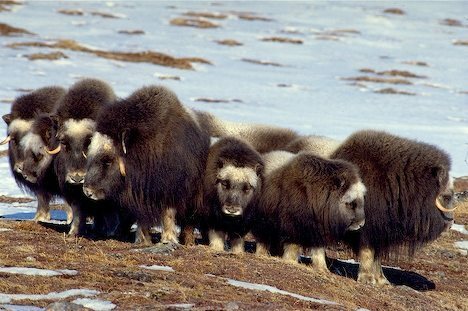 When musk oxen are afraid, they form a line facing the danger. In some cases, they form a circle facing out with the young inside the circle. The enemy will think twice before attacking. A strike from a musk ox’s horn can maim or even kill a foe. The adults told the calves to get into the circle they were forming for protection. Felix immediately turned to follow his mom, Idette, to the group. “I’m going to the circle.” answered Felix. Felix didn’t know what to do. Should he do what he knew he should and obey? Should he go with his friend where the fun is? Felix hesitated, debating with himself. He started toward Lance who was leaving. Then Felix glanced over his shoulder toward his mom. She was almost to the circle. He remembered how his mom loved him and wanted what was best for him. He remembered the times Lanced mouthed off to his mother and the look of hurt on her face. What do you think Felix did? Felix followed his mom. He got right behind her in the circle. She turned and smiled and winked at him. It was like she knew how he had struggled and won the battle inside himself. He was glad he obeyed. Lance went over by the trees expecting Felix to follow. He was mistaken. An arctic fox snuck upon the musk oxen. They stood their ground against the fox. The fox couldn’t get to the calves so it attacked the smallest of the adults. It was a mistake. The musk ox butted her head and flung the fox away. It got up, and out of the corner of its eye saw one lone musk ox. With a mighty leap, it tore off after Lance. Lance saw it coming and lowered his head. He thought he was big enough to defend himself. Lance butted the fox, but it came again. Lance tried to block it, but it grabbed a mouth full of his fur. The fox tried to pull Lance over so it could go for his throat. The group of musk oxen saw the fox go after Lance. As one, they ran toward Lance. They didn’t break formation. The one who was closest butted the fox. The fox lost his grasp on Lance. Lance ran to the protection of the circle. He slipped in just as the fox lept toward him. One of the musk oxen intercepted the fox, butting it and knocking it against a tree. Shaking its head, the fox slowly got up and limped away. The impact with the tree had injured its paw. The musk oxen forgave him. Lance learned a life lesson. The older and wiser deserve respect. They do things because they have learned it works. They tell the younger ones to do things for their protection. They love and protect each other. Boys and girls, we can learn from this story. We can see that being disrespectful is wrong, and it can lead to something bad. Doing what we want in our own way, is not what we should do. God has put our parents and other adults in our lives for our protection. They have learned what works best and what the dangers are. They shouldn’t have to explain why we need to obey. We should obey because they are our elders. We need to respect them. The Lord has told parents to train their children. Parents who train their children are obeying the Lord. Remember to talk nicely to your elders. Don’t make faces when they say things you don’t like to hear. Be respectful to them.